I wen thru my Amex bill today in some detail. It's a big bill, it's my corporate one. A few things popped out at me. Now I think the same problem exists with Visaand Mastercard but I think they have really taken a minimalist aproach to providing information on transactions to consumers. In fact, each vendor has already passed all this info to their merchant account vendor. We usually like PayPal as our merchant account vendor and over the last few years, have been moving increasing amounts of our business towards you. You probably handle about 25% of our merchant account business. I just realized from your email that there is no record kept of messages sent to Paypal within the account through the "contact us" function. That's not a quality design. I should not have to type this all over again. But I will. I'm hoping to just give you good feedback. Will you make a point of passing that on? Specifically, there should be a record kept of the messages sent within the contact us form to paypal. Thanks. There's two core problems in how we appear on the Amex credit cards of our users. 1. Our name. We are xyz, not xz. (obviulsy, I'm ot putting up our real name but you get the idea). 2. The categories. . I run an online educational service for K12 education. I'd like the receipt when people pay for the service to accurately reflect what we do. But, we have spent a great deal of time looking at the choices and pulldowns that Paypal provides and we cannot find any of them that are adequate. This is a real problem and causes a fair amount of really counterproductive discussion with customers about the bill. I start under the Profile, My Account, Review/Edit your information. We are in the education business. Paypal does have an education category. There should be under education, a subcategory of "digital content". There's not. Obviously, it is deceitful and somewhat illegal in some states for interactive learning websites, tutoring services, educational services etc to call themselves schools so this creates a real problem. Under Books and Magazines, there's a subcategory called "Educational and Textbooks". But we're not a book or magazine. Under computers, there's "Digital Content" or "Software" or "Training Services"
Under "services other", there's nothing particularly relevant. Bottom line, I'm listing SpellingCity as "Computers, Digital Content." I just switched it from Education, Secretarial Services which was clearly wrong, it's just not clear what else is better. Anybody know why Paypal can't or doesn't give better choices? 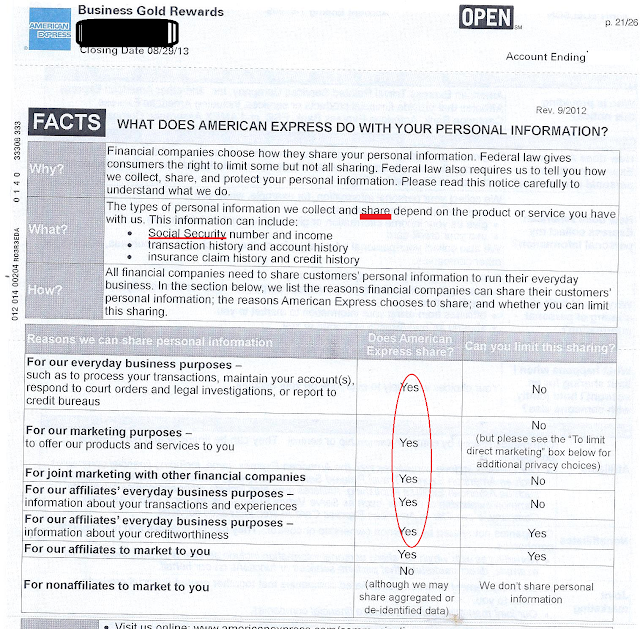 I looked closely at my corporate AMEX bill this month and noticed some things that amazed. One was that they had a very clear well-written easy-to-read statement about their privacy. BRAVO. Secondly, their statement basically was that I have no privacy. Thgey are basically saying that all of my transactions can be used for their purposes and their affiliates purposes. These can be used for marketing and for "everyday business" purposes. Even my social security number and income, which I assumed had some privacy around it, can be broadly shared to anyone that they decide to "affiliate" with. Affiliate is defined later on as companies they own or control. 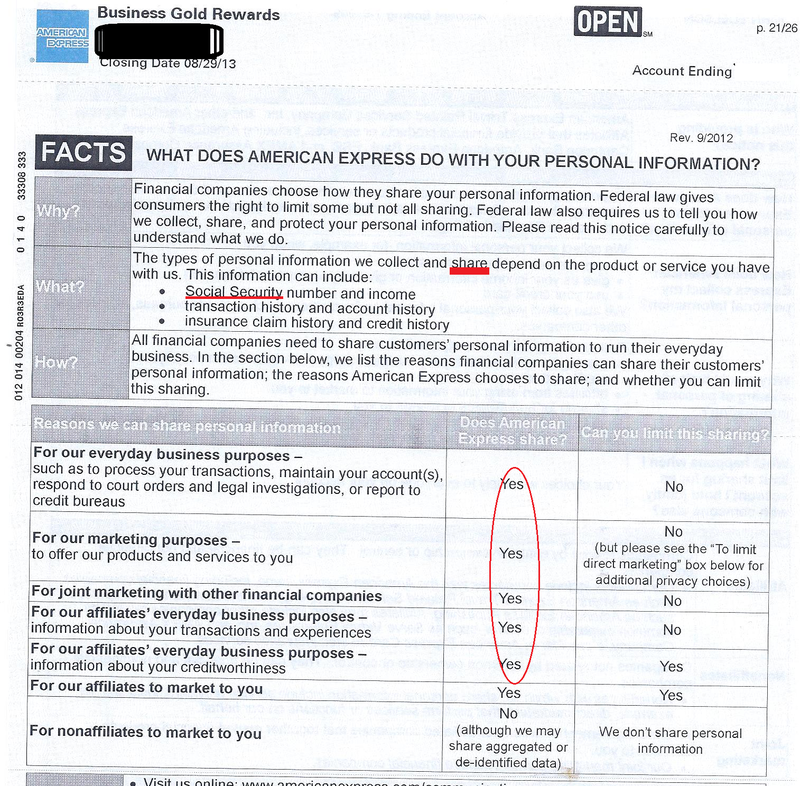 There's also directions on "opt-out" which will limit how much cirect marketing comes to us. It does not opt out of other sharing of my data.